But, the charts are setting up for a bullish move that could take the yellow metal sharply higher, said Miller Tabak equity strategist Matt Maley Wednesday on CNBC's "Trading Nation." 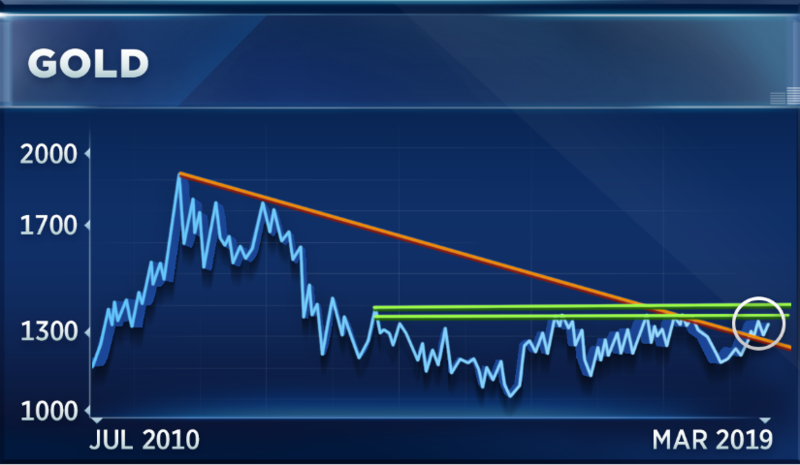 "Look at the chart on gold, it's broken above its trend line going all the way back to those 2011 highs. That's very positive," he said. "We're really going to need for it to break above the key level which is a range of $1,360 to $1,380. If we get above that $1,380 level, that was the top in 2014, 2016, 2017 and 2018," he said. "Whenever you get multiple touches over several different years, if you can finally break above that level, it really takes off. In other words, it confirms that the long-term trend has changed,"
"We do need that final push above the $1,380 level before we can really pound the table and say the bear market in gold is over," he said. Michael Bapis, managing director of Vios Advisors at Rockefeller Capital Management, said Wednesday on "Trading Nation" that the recent outperformance in gold and gold miners is justified, but he's not buying into the rally yet. "I think it's early in the gold trade," said Bapis. "You buy gold when times are turbulent. I think that's probably why you saw it rally in the fourth quarter because people were sort of panicking during that market downturn when it was a sell-everything market." The GLD gold trust ETF rallied 8 percent in the fourth quarter as the S&P 500 plummeted 14 percent. It was gold's best quarter since 2016 and the S&P 500's worst since 2011. "But, I'm not rushing to buy gold or gold stocks at this point. We still think there are legs on the equity markets going forward and the economy is strong so I don't think you'll see people rushing into gold for at least the foreseeable future," Bapis said.